At the Guild at 51, Cheltenham, an exhibition of contemporary craft for the home, featuring handcrafted furniture and lighting by Kristian Pettifor and David Ian Smith and textiles by Jenny Bicat. Following the success of last year’s, Home Sweet Home exhibition, Living with Nature’s Design revisits handmade pieces for interiors, taking forms and patterns in nature as a design starting block to produce new work specifically for The Guild at 51. Furniture designer-makers, Kristian Pettifor and David Ian Smith have made a table, a chest of drawers and lighting, which will be complimented by textile panels from Jenny Bicât. Jenny Bicât has made sheer linen panels that can work as room dividers, wall hangings or window adornments, but most importantly can be enjoyed from both sides. 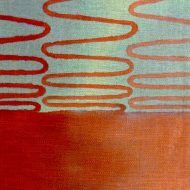 They are printed and painted with patterns inspired by ripples and reflections in nature. Kristian Pettifor has been exploring the aesthetic beauty of spirals and repeat patterns found in our natural environment. The low table made for the exhibition will showcase movement, pattern and texture. A combination of modern technologies will aid efficiency with repeat patterns whilst being complimented with traditional craftsmanship techniques. David Ian Smith has designed and made pendent lampshades using inspiration from patterns that emerge when a single common element is repeated and offset. This is a common design trick of nature; fish scales and bird feathers, plants and coral, all have the common natural design of repetitious shapes that form patterns. 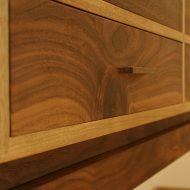 David’s other contribution to the exhibition is a chest of drawers in oak and walnut using elements of water as inspiration. Quite often within nature you have to look closely to see the things that matter, the moss under the rock or the fish in the river. 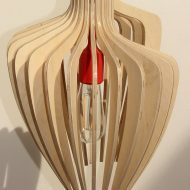 This simplistic cabinet design hides the detail within.